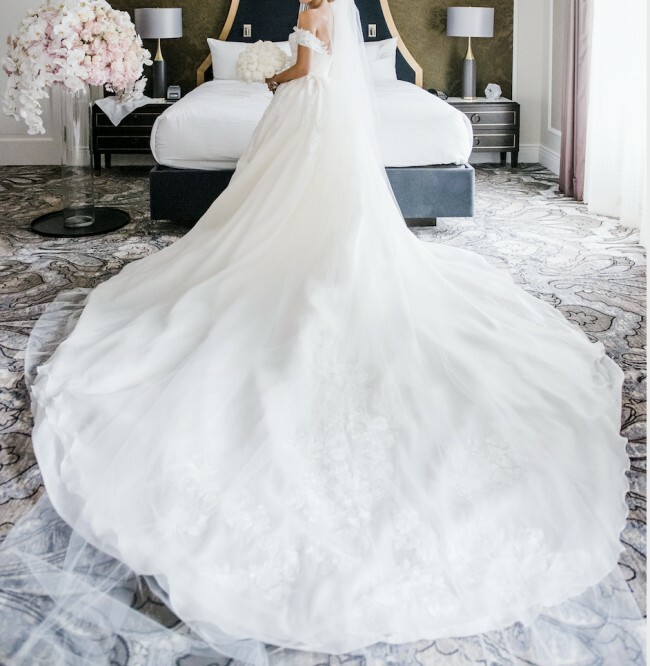 A STUNNING wedding dress that I am sad to part ways with because it was rather jaw-dropping and it took me forever to find! This is a ballgown of any girl's dreams by Pronovias atelier- which is their couture line. The skirt is dreamy long organza and photographs BEAUTIFULLY. Gently worn as I had a second wedding dress for the evening. The embroidered organza with beaded appliqués and the sweetheart neckline are the two highlights of this impressive ballgown wedding dress with pockets in the skirt. A spectacular design that plays with the volume of the skirt, contrasting it with the form-fitting bodice and open back. Dress is made to be strapless but I added removable off the shoulder sleeves as well that you can choose to wear with it. There is a hidden clasp in the corset of the dress that attaches the custom made off the shoulder straps if you do choose to wear it. I wore mine for about half the day and then removed them (super easy clasp to remove). I also had Swarovski crystals added to the top of the dress (sparingly) for even more glamour. Please note the skirt is drama! I ordered the extra length from Pronovias but certainly I am sure you can alter it shorter, if you wish. Once you send a message, Par can invite you to purchase the dress.